If you’re not getting the attention, the clients, the cash that you want in your business… that’s almost certainly got to do with how you talk about your work. When your brand message is razor sharp, you know that when you send clients to your website, they’ll quickly understand what you do & whether it’s right for them. They’ll hit the ‘buy now’ button with speed & confidence. You don’t waste time on less-than-ideal clients. Your marketing runs smoothly & gets better traction. The results are real & tangible. And I’m a living, breathing example of that. It’s all because the right people are attracted to your brand message & that magnetic attraction turns them into paying clients so much faster. 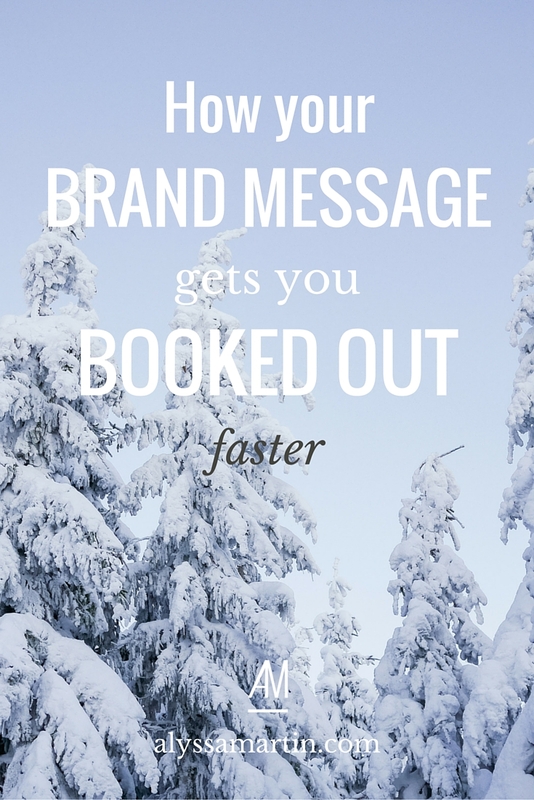 Here are 5 ways that your brand message helps you get booked out, lickety split. Just like a good headline, a brilliantly memorable brand message makes the right people sit up and pay attention. It piques their curiosity & makes them want to keep reading to find out more. And as they keep reading, your message gets clearer & stronger in their head as each new page, headline, blog post, and call to action reinforces the big message you want to share. You’ve got them hook, line & sinker. Your clients land on your site & what you do & how you can help them jumps off the page. Gone are the days where people land on your website, get confused & quickly click away, never to return. Now, the right people know what you do & whether it’s designed for people just like them. Think: results, deliverables, savings and all the things that make your client’s lives easier. It makes your dream clients realise how much they need you right now. They can imagine how working with you is going to solve their problems & get them so much closer to the life / business / waistline / photoshoot / hair that they want. Your services start to sell themselves and all your other marketing efforts become so much easier. That’s the power of having a website that connects with the right people & converts them into paying clients. All this talk about getting more clients & making more money is great – we all need to pay the bills. But you & I both know that we’re really here because we want to help people in ways big & small. It’s a HUGE confidence boost to finally have a clear brand message that makes it clear what you do & how valuable that is. Imagine seeing all your awesomeness on one site & having your dream clients connect with what you’re offering so much that they’re signing up faster & paying you more. How exciting does that feel?! It validates all the hard work you’ve put into building this business, doesn’t it? Confidence is a big part of sales. When you feel confident about your message & the impact of your work, sales conversations suddenly don’t feel slimy anymore. It just feels like you’re sharing your messaging & are open to the right people hearing it. The fear & what-ifs that can come with selling yourself start to fade away because you know that the right people will resonate with your words. And that happens because you know that your message will appeal to your dream clients & repel the rest – because it’s finally focused on the value you bring to the table. P.S. Worried that your brand message is failing you? Read this.